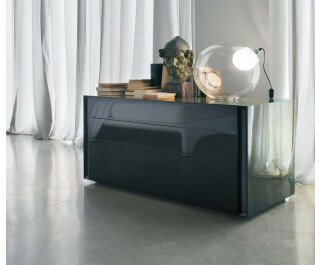 Designed by Marelli & Molteni, LUNA is a family consisting of bedside tables, high and low drawer units with a captivating, discreet elegance. The delicate and sober line is enhanced by lateral incisions that give these containers a unique personality. Available with refined 45° joints and lacquered matte or gloss finishes, in over 40 colours.